When it comes to consistency, British beauty Pascale Edwards-Labelle has a routine we can all be envious of. 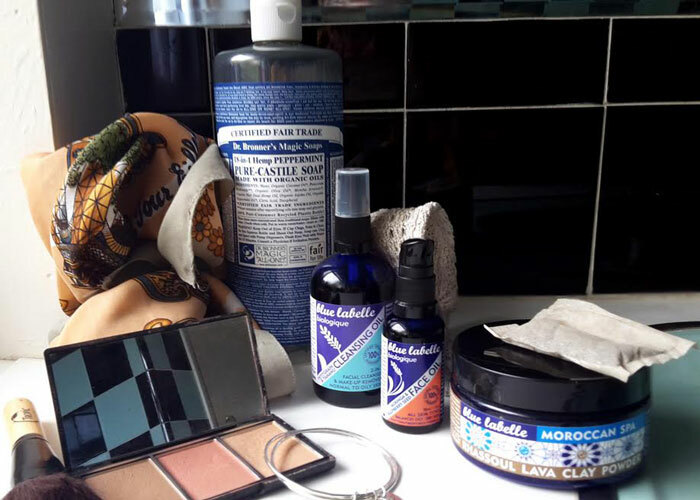 The founder of Blue Labelle Skincare, which is made on the gorgeous Isle of Wight, keeps her beauty prep streamlined and simple, with a focus on vegan products that she knows won’t irritate her skin. And, of course, because she loves and believes in her skincare creations. As do I. I’ve had the opportunity to try many of Pascale’s products (and even provide some personal feedback on her formulas! ), and what she’s created is the perfect combination of effective, pretty, affordable and unique. Just like Miss Pascale. I loved reading about her favorite beauty, lifestyle and personal care products so much that as I was putting together this feature, I just had to have two cups of organic tea. And, perhaps, I might be dreaming up a visit to the Isle of Wight, too. It smells so good and just laughs in the face of any makeup or grime my face has picked up in the day. I use it with one of our organic hemp cloths for hot cloth cleansing and gentle exfoliation. My favorite face oil. Its perfume is green and spicy and it contains geranium, my favorite essential oil. I’ve put geranium oil on my face every day for years. Such a versatile ingredient, known as “the King of Clays,” it can used in face masks, scrubs and even for body and hair washing. I love to do a rhassoul clay face mask, and my skin always looks renewed and refreshed afterwards. You can add a number of different ingredients, such as oils and floral waters, to the clay. For me, every morning starts with a cup of tea, followed by another. If I drink coffee, it’s normally after lunch. This tea is excellent; it makes a strong brew, is fair trade and organic, and comes in an unbleached bag. I much prefer to drink organic tea since hearing of the pesticides and toxins that can be found in cups of non-organic tea. Choosing organic is better for the plantation land and workers, too, of course. And yes, I don’t mind if my bag is not white. I prefer it to be brown and not bleached! Peppermint Dr. Bronner’s was the first natural shower product that I ever used nearly 10 years ago, and I haven’t looked back! So zingy, organic and vegan — and it has so many uses! The company has a great ethos. We’ve finished this big beast of a bottle — must buy more again soon. I don’t wear makeup every day, but if I do, it’s this. It took me a while to find a blusher that didn’t use animal ingredients like carmine. This three-color palette is vegan, contains organic ingredients and looks great on my skin. These silver bangles were given to me by my sister and niece and made by Honeybourne Jewellery in the town of Ventnor, where I live on the Isle of Wight. They are from the range “Rex’s Pieces of Eight,” named after their son and have personalized charms hung on silver stacking bangles with a soft hammered texture. I love Sophie Honeybourne’s jewellery and often find myself, without realizing it, wearing earrings necklace and bracelets all made by her. Perhaps because I am half-French, I often wear a scarf around my head or my neck. This one actually features Parisian landmarks! It’s a vintage scarf purchased from a local charity shop.